I always enjoy my annual visit to the Octagon Theatre in Yeovil. This year YAPS celebrates thirty five years of laughter and entertaining Yeovil audiences. I am always aware that when the talented Steve Hentschel puts pen to paper he will be transporting us away from the norm and there is certainly nothing wrong with that. As runners up in last years’ Cinderella competition was this society going to milk it for all it was worth a second time around? Jack and the Beanstalk is my all-time favourite. I have never seen a disco-tastic version so was very much looking forward to watching Steve’s interpretation of the show. Thank you so much for the warm welcome from director Felicity Keirle and for the box of chocs. You certainly know how to spoil a moderator! With a cast of around eighty there was certainly no pressure for Felicity and her partner in crime choreographer Jez Smith! From the beginning through to the final bow this was a vibrant, colourful and upbeat production and pace never faltered. Stage sets hired from Scenic Projects Ltd was a great choice and added visual appeal to the pantomime. 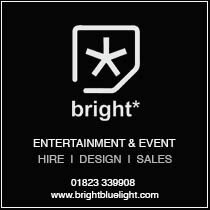 Lighting was expertly managed throughout by the Octagon Theatre. This society has a talented team and it was a joy to see so many up and coming competent young performers treading the boards. Every character is worthy of a mention but at times the delivery of lines went unheard by some principals. Diction needed slowing down on several occasions. More emphasis and visual expressions were also required. The adjudication report will mention all of the principals but here a just a few who caught my eye. At just fifteen years of age Anastacia Hayward’s Jill Halfpint was played delightfully. You gave a mature performance Anastacia and engaged with your audience at all times. You had a terrific singing voice (despite the band overshadowing you on your opening number). I had a dream was most memorable. I wish I could have heard more from you. Excellent! Maia Henley’s Jack Trott portrayed this character commendably . At fourteen years of age you played your part well Maia, showing maturity beyond your years. Madison Parks-Keirle gave an outstanding performance as Squire Halfpint. At just twelve years old you defined this character extremely well Madison and graced the stage tremendously. You were fascinating to watch and I loved your enthusiasm. Very well played indeed. Steve Hentschel’s Niteshayde gave a rock solid performance. Gosh, I wouldn’t want to bump into you down a dark lane in East Coker! You had great vocal attack and a strong stage presence with a powerful voice. The very manifestation of evil! I enjoyed your one-liners, especially the one about the Prince. This was very funny and a great last-minute one to include. The best line of the evening! Great work Steve. Congratulations to the lead and junior dance and ensemble teams. This was a full on and high-energy performance from beginning to end. Although it was difficult to observe everyone at any given time, it was evident you had all done everything the choreographer had asked of you. You are a high standard troupe and made this show the spectacle it was. There were some great numbers in this pantomime and many took me back to my school days. I loved all of your ‘Mash Up’s’, especially the dance off. You had a brilliant band, yet it was a disappointing that on occasions they seemed to drown the performers. Toning the volume down just a little would have enhanced the overall production. Crescendo comes to mind! I enjoyed your ghost scene. This was well handled by principals and the ending was timed immaculately. When we finally saw the animated Giant he was sensational and the co-ordination and manipulation was excellent. What a good idea to have adults up on stage rather than children. I really enjoyed your disco dancing competition. It was a great laugh to see Mum’s, Dad’s, Aunt’s and Uncle’s all ‘strutting their stuff’. Thank you for not picking me! It was evident that a tremendous amount of hard work and thought had gone into this production. It was a show with a difference but the story line remained unchanged. 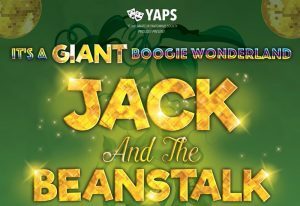 Thank you YAPS for a memorable pantomime. I enjoyed your show and very much look forward to watching your Wizardly Wonders in 2020.